Third president of the United States of America, and the most conspicuous apostle of democracy in America, was born on the 13th of April 1743, at Shadwell, Albemarle county, Virginia. His father, Peter Jefferson (1707-1757), of early Virginian yeoman stock, was a civil engineer and a man of remarkable energy, who became a justice of the peace, a county surveyor and a burgess, served the Crown in inter-colonial boundary surveys, and married into one of the most prominent colonial families, the Randolphs. Albemarle county was then in the frontier wilderness of the Blue Ridge, and was very different, socially, from the lowland counties where a few broad-acred families dominated an open-handed, somewhat luxurious and assertive aristocracy. Unlike his Randolph connections, Peter Jefferson was a whig and a thorough democrat; from him, and probably, too, from the Albemarle environment, his son came naturally by democratic inclinations. Jefferson carried with him from the college of William and Mary at Williamsburg, in his twentieth year, a good knowledge of Latin, Greek and French (to which he soon added Spanish, Italian and Anglo-Saxon), and a familiarity with the higher mathematics and natural sciences only possessed, at his age, by men who have a rare natural taste and ability for those studies. He remained an ardent student throughout life, able to give and take in association with the many scholars, American and foreign, whom he numbered among his friends and correspondents. With a liberal Scotsman, Dr. William Small, then of the faculty of William and Mary and later a friend of Erasmus Darwin, and George Wythe (1726-1806), a very accomplished scholar and leader of the Virginia bar, Jefferson was an habitual member, while still in college, of a partie carree at the table of Francis Fauquier (c. 1720-1768), the accomplished lieutenant-governor of Virginia. Jefferson was an expert violinist, a good singer and dancer, proficient in outdoor sports, and an excellent horseman. Thorough-bred horses always remained to him a necessary luxury. When it is added that Fauquier was a passionate gambler, and that the gentry who gathered every winter at Williamsburg, the seat of government of the province, were ruinously addicted to the same weakness, and that Jefferson had a taste for racing, it does credit to his early strength of character that of his social opportunities he took only the better. He never used tobacco, never played cards, never gambled, and was never party to a personal quarrel. Soon after leaving college he entered Wythe's law office, and in 1767, after five years of close study, was admitted to the bar. His thorough preparation enabled him to compete from the first with the leading lawyers of the colony, and his success shows that the bar had no rewards that were not fairly within his reach. As an advocate, however, he did not shine; a weakness of voice made continued speaking impossible, and he had neither the ability nor the temperament for oratory. To his legal scholarship and collecting zeal Virginia owed the preservation of a large part of her early statutes. He seems to have lacked interest in litigiousness, which was extraordinarily developed in colonial Virginia; and he saw and wished to reform the laws abuses. It is probable that he turned, therefore, the more willingly to politics; at any rate, soon after entering public life he abandoned practice (1774). The death of his father had left him an estate of 1900 acres, the income from which (about �400) gave him the position of an independent country gentleman; and while engaged in the law he had added to his farms after the ambitious Virginia fashion, until, when he married in his thirtieth year, there were 5000 acres all paid for; and almost as much more came to him in 1773 on the death of his father-in-law. On the 1st of January 1772, Jefferson married Martha Wayles Skelton (1749-1782), a widow of twenty-three, very handsome, accomplished, and very fond of music. Their married life was exceedingly happy, and Jefferson never remarried after her early death. Of six children born from their union, two daughters alone survived infancy. Jefferson was emotional and very affectionate in his home, and his generous and devoted relations with his children and grandchildren are among the finest features of his character. Jefferson began his public service as a justice of the peace and parish vestryman; he was chosen a member of the Virginia house of burgesses in 1769 and of every succeeding assembly and convention of the colony until he entered the Continental Congress in 1775. His forceful, facile pen gave him great influence from the first; but though a foremost member of several great deliberative bodies, he can fairly be said never to have made a speech. He hated the "morbid rage of debate" because he believed that men were never convinced by argument, but only by reflection, through reading or unprovocative conversation; and this belief guided him through life. Moreover it is very improbable that he could ever have shone as a public speaker, and to this fact unfriendly critics have attributed, at least in part, his abstention from debate. The house of burgesses of 1769, and its successors in 1773 and 1774, were dissolved by the governor for their action on the subject of colonial grievances and intercolonial co-operation. Jefferson was prominent in all; was a signer of the Virginia agreement of non-importation and economy (1769); and was elected in 1774 to the first Virginia convention, called to consider the state of the colony and advance intercolonial union. Prevented by illness from attending, Jefferson sent to the convention elaborate resolutions, which he proposed as instructions to the Virginia delegates to the Continental Congress that was to meet at Philadelphia in September. In the direct language of reproach and advice, with no disingenuous loading of the Crown's policy upon its agents, these resolutions attacked the errors of the king, and maintained that "the relation between Great Britain and these colonies was exactly the same as that of England and Scotland after the accession of James and until the Union; and that our emigration to this country gave England no more rights over us than the emigration of the Danes and Saxons gave to the present authorities of their mother country over England." This was cutting at the common root of allegiance, emigration and colonization; but such radicalism was too thorough-going for the immediate end. The resolutions were published, however, as a pamphlet, entitled A Summary View of the Rights of America, which was widely circulated. In England, after receiving such modifications -- attributed to Burke -- as adapted it to the purposes of the opposition, this pamphlet ran through many editions, and procured for its author, as he said, "the honor of having his name inserted in a long list of proscriptions enrolled in a bill of attainder commenced in one of the two houses of parliament, but suppressed in embryo by the hasty course of events." It placed Jefferson among the foremost leaders of revolution, and procured for him the honor of drafting, later, the Declaration of Independence, whose historical portions were, in large part, only a revised transcript of the Summary View. In June 1775 he took his seat in the Continental Congress, taking with him fresh credentials of radicalism in the shape of Virginia's answer, which he had drafted, to Lord North's conciliatory propositions. Jefferson soon drafted the reply of Congress to the same propositions. Reappointed to the next Congress, he signalized his service by the authorship of the Declaration of Independence. Again reappointed, he surrendered his seat, and after refusing a proffered election to serve as a commissioner with Benjamin Franklin and Silas Deane in France, he entered again, in October 1776, the Virginia legislature, where he considered his services most needed. The local work to which Jefferson attributed such importance was a revision of Virginia's laws. Of the measures proposed to this end he says: "I considered four, passed or reported, as forming a system by which every trace would be eradicated of ancient or future aristocracy, and a foundation laid for a government truly republican" -- the repeal of the laws of entail; the abolition of primogeniture and the unequal division of inheritances (Jefferson was himself an eldest son); the guarantee of freedom of conscience and relief of the people from supporting, by taxation, an established church; and a system of general education. The first object was embodied in law in 1776, the second in 1785, the third in 1786 (supplemented 1799, 1801). The last two were parts of a body of codified laws prepared (1776-1779) by Edmund Pendleton, George Wythe, and Jefferson, and principally by Jefferson. Not so fortunate were Jefferson's ambitious schemes of education. District, grammar and classical schools, a free state library and a state college, were all included in his plan. He was the first American statesman to make education by the state a fundamental article of democratic faith. His bill for elementary education he regarded as the most important part of the code, but Virginia had no strong middle class, and the planters would not assume the burden of educating the poor. At this time Jefferson championed the natural right of expatriation, and gradual emancipation of the slaves. His earliest legislative effort, in the five-day session of 1769, had been marked by an effort to secure to masters freedom to manumit their slaves without removing them from the state. It was unsuccessful, and the more radical measure he now favored was even more impossible of attainment; but a bill he introduced to prohibit the importation of slaves was passed in 1778 -- the only important change effected in the slave system of the state during the War of Independence. Finally he endeavoured, though unsuccessfully, to secure the introduction of juries into the courts of chancery, and -- a generation and more before the fruition of the labors of Romilly and his coworkers in England -- aided in securing a humanitarian revision of the penal code, which, though lost by one vote in 1785, was sustained by public sentiment, and was adopted in 1796. Jefferson is of course not entitled to the sole credit for all these services: Wythe, George Mason and James Madison, in particular, were his devoted lieutenants, and -- after his departure for France -- the principals in the struggle; moreover, an approving public opinion must receive large credit. But Jefferson was throughout the chief inspirer and foremost worker. In 1779, at almost the gloomiest stage of the war in the southern states, Jefferson succeeded Patrick Henry as the governor of Virginia, being the second to hold that office after the organization of the state government. In his second term (1780-1781) the state was overrun by British expeditions, and Jefferson, a civilian, was blamed for the ineffectual resistance. Though he cannot be said to have been eminently fitted for the task that devolved upon him in such a crisis, most of the criticism of his administration was undoubtedly grossly unjust. His conduct being attacked, he declined renomination for the governorship, but was unanimously returned by Albemarle as a delegate to the state legislature; and on the day previously set for legislative inquiry on a resolution offered by an impulsive critic, he received, by unanimous vote of the house, a declaration of thanks and confidence. He wished however to retire permanently from public life, a wish strengthened by the illness and death of his wife. At this time he composed his Notes on Virginia, a semistatistical work full of humanitarian liberalism. Congress twice offered him an appointment as one of the plenipotentiaries to negotiate peace with England, but, though he accepted the second offer, the business was so far advanced before he could sail that his appointment was recalled. During the following winter (1783) he was again in Congress, and headed the committee appointed to consider the treaty of peace. In the succeeding session his service was marked by a report, from which resulted the present monetary system of the United States (the fundamental idea of its decimal basis being due, however, to Gouverneur Morris); and by the honor of reporting the first definitely formulated plan for the government of the western territories, that embodied in the ordinance of 1784. He was already particularly associated with the great territory north-west of the Ohio; for Virginia had tendered to Congress in 1781, while Jefferson was governor, a cession of her claims to it, and now in 1784 formally transferred the territory by act of Jefferson and his fellow delegates in congress: a consummation for which he had labored from the beginning. His anti-slavery opinions grew in strength with years (though he was somewhat inconsistent in his attitude on the Missouri question in 1820-1821). Not only justice but patriotism as well pleaded with him the cause of the negroes, for he foresaw the certainty that the race must some day, in some way, be freed, and the dire political dangers involved in the institution of slavery; and could any feasible plan of emancipation have been suggested he would have regarded its cost as a mere bagatelle. From 1784 to 1789 Jefferson was in France, first under an appointment to assist Benjamin Franklin and John Adams in negotiating treaties of commerce with European states, and then as Franklins successor (1785-1789) as minister to France. In these years he travelled widely in western Europe. Though the commercial principles of the United States were far too liberal for acceptance, as such, by powers holding colonies in America, Jefferson won some specific concessions to American trade. He was exceedingly popular as a minister. The criticism is even today current with the uninformed that Jefferson took his manners, morals, "irreligion" and political philosophy from his French residence; and it cannot be wholly ignored. It may therefore be said that there is nothing except unsubstantiated scandal to contradict the conclusion, which various evidence supports, that Jefferson's morals were pure. His religious views and political beliefs will be discussed later. His theories had a deep and broad basis in English whiggism; and though he may well have found at least confirmation of his own ideas in French writers -- and notably in Condorcet -- he did not read sympathetically the writers commonly named, Jean-Jacques Rousseau and Montesquieu; besides, his democracy was seasoned, and he was rather a teacher than a student of revolutionary politics when he went to Paris. The Notes on Virginia were widely read in Paris, and undoubtedly had some influence in forwarding the dissolution of the doctrines of divine rights and passive obedience among the cultivated classes of France. Jefferson was deeply interested in all the events leading up to the French Revolution, and all his ideas were colored by his experience of the five seething years passed in Paris. On the 3rd of June 1789 he proposed to the leaders of the third estate a compromise between the king and the nation. In July he received the extraordinary honor of being invited to assist in the deliberations of the committee appointed by the national assembly to draft a constitution. This honor his official position compelled him, of course, to decline; for he sedulously observed official proprieties, and in no way gave offence to the government to which he was accredited. When Jefferson left France it was with the intention of soon returning; but President Washington tendered him the secretaryship of state in the new federal government, and Jefferson reluctantly accepted. His only essential objection to the constitution -- the absence of a bill of rights -- was soon met, at least partially, by amendments. Alexander Hamilton was secretary of the treasury. These two men, antipodal in temperament and political belief, clashed in irreconcilable hostility, and in the conflict of public sentiment, first on the financial measures of Hamilton, and then on the questions with regard to France and Great Britain, Jefferson's sympathies being predominantly with the former, Hamilton's with the latter, they formed about themselves the two great parties of Democrats and Federalists. The schools of thought for which they stood have since contended for mastery in American politics: Hamilton's gradually strengthened by the necessities of stronger administration, as time gave widening amplitude and increasing weight to the specific powers -- and so to Hamilton's great doctrine of the "implied powers" -- of the general government of a growing country; Jefferson's rooted in colonial life, and buttressed by the hopes and convictions of democracy. The most perplexing questions treated by Jefferson as secretary of state arose out of the policy of neutrality adopted by the United States toward France, to whom she was bound by treaties and by a heavy debt of gratitude. Separation from European politics -- the doctrine of "America for Americans" that was embodied later in the Monroe declaration -- was a tenet cherished by Jefferson as by other leaders (not, however, Hamilton) and by none cherished more firmly, for by nature he was peculiarly opposed to war, and peace was a fundamental part of his politics. However deep, therefore, his French sympathies, he drew the same safe line as did Washington between French politics and American politics, and handled the Genet complications to the satisfaction of even the most partisan Federalists. He expounded, as a very high authority has said, "with remarkable clearness and power the nature and scope of neutral duty," and gave a "classic" statement of the doctrine of recognition. But the French question had another side in its reaction on American parties. Jefferson did not read excesses in Paris as warnings against democracy, but as warnings against the abuses of monarchy; nor did he regard Bonaparte's coup d'etat as revealing the weakness of republics, but rather as revealing the danger of standing armies; he did not look on the war of the coalitions against France as one of mere powers, but as one between forms of government; and though the immediate fruits of the Revolution belied his hopes, as they did those of ardent humanitarians the world over, he saw the broad trend of history, which vindicated his faith that a successful reformation of government in France would insure "a general reformation through Europe, and the resurrection to a new life of their people." Each of these statements could be reversed as regards Hamilton. It is the key to an understanding of the times to remember that the War of Independence had disjointed society; and democracy -- which Jefferson had proclaimed in the Declaration of Independence, and enthroned in Virginia -- after strengthening its rights by the sword, had run to excesses, particularly in the Shays' rebellion, that produced a conservative reaction. To this reaction Hamilton explicitly appealed in the convention of 1787; and of this reaction various features of the constitution, and Hamiltonian federalism generally, were direct fruits. Moreover, independently of special incentives to the alarmist and the man of property, the opinions of many Americans turned again, after the war, into a current of sympathy for England, as naturally as American commerce returned to English ports. Jefferson, however, far from America in these years and unexposed to reactionary influences, came back with undiminished fervor of democracy, and the talk he heard of praise for England, and fearful recoil before even the beginning of the revolution in France, disheartened him, and filled him with suspicion. Hating as he did feudal class institutions and Tudor-Stuart traditions of arbitrary rule, his attitude can be imagined toward Hamilton's oft-avowed partialities -- and Jefferson assumed, his intrigues -- for British class-government with its eighteenth-century measure of corruption. In short, Hamilton took from recent years the lesson of the evils of lax government; whereas Jefferson clung to the other lesson, which crumbling colonial governments had illustrated, that governments derived their strength (and the Declaration had proclaimed that they derived their just rights) from the will of the governed. Each built his system accordingly: the one on the basis of order, the other on individualism -- which led Jefferson to liberty alike in religion and in politics. The two men and the fate of the parties they led are understandable only by regarding one as the leader of reaction, the other as in line with the American tendencies. The educated classes characteristically furnished Federalism with a remarkable body of alarmist leaders; and thus it happened that Jefferson, because, with only a few of his great contemporaries, he had a thorough trust and confidence in the people, became the idol of American democracy. As Hamilton was somewhat officious and very combative, and Jefferson, although uncontentious, very suspicious and quite independent, both men holding inflexibly to opinions, cabinet harmony became impossible when the two secretaries had formed parties about them and their differences were carried into the newspapers; and Washington abandoned perfoce his idea "if parties did exist to reconcile them." Partly from discontent with a position in which he did not feel that he enjoyed the absolute confidence of the president, and partly because of the embarrassed condition of his private affairs, Jefferson repeatedly sought to resign, and finally on the 31st of December 1793, with Washington's reluctant consent, gave up his portfolio and retired to his home at Monticello, near Charlottesville. Here he remained improving his estate (having refused a foreign mission) until elected vice-president in 1796. Jefferson was never truly happy except in the country. He loved gardening, experimented enthusiastically in varieties and rotations of crops and kept meteorological tables with diligence. For eight years he tabulated with painful accuracy the earliest and latest appearance of thirty-seven vegetables in the Washington market. When abroad he sought out varieties of grasses, trees, rice and olives for American experiment, and after his return from France received yearly for twenty-three years, from his old friend the superintendent of the Jardin des plantes, a box of seeds, which he distributed to public and private gardens throughout the United States. Jefferson seems to have been the first discoverer of an exact formula for the construction of mould-boards of least resistance for ploughs. He managed to make practical use of his calculus about his farms, and seems to have been remarkably apt in the practical application of mechanical principles. In the presidential election of 1796 John Adams, the Federalist candidate, received the largest number of electoral votes, and Jefferson, the Republican candidate, the next largest number, and under the law as it then existed the former became president and the latter vice-president. Jefferson re-entered public life with reluctance, though doubtless with keen enough interest and resolution. He had rightly measured the strength of his followers, and was waiting for the government to "drift into unison" with the republican sense of its constituents, predicting that President Adams would be "overborne" thereby. This prediction was speedily fulfilled. At first the reign of terror and the X. Y. Z. disclosures strengthened the Federalists, until these, mistaking the popular resentment against France for a reaction against democracy -- an equivalence in their own minds -- passed the alien and sedition laws. In answer to those odious measures Jefferson and Madison prepared and procured the passage of the Kentucky and Virginia resolutions. These resolutions later acquired extraordinary and pernicious prominence in the historical elaboration of the states-rights doctrine. It is, however, unquestionably true, that as a startling protest against measures "to silence", in Jefferson's words, "by force and not by reason the complaints or criticisms, just or unjust, of our citizens against the conduct of our agents," they served, in this respect, a useful purpose; and as a counterblast against Hamiltonian principles of centralization they were probably, at that moment, very salutary; while even as pieces of constitutional interpretation it is to be remembered that they did not contemplate nullification by any single state, and, moreover, are not to be judged by constitutional principles established later by courts and war. The Federalist party had ruined itself, and it lost the presidential election of 1800. The Republican candidates, Jefferson and Aaron Burr, receiving equal votes, it devolved upon the House of Representatives, in accordance with the system which then obtained, to make one of the two president, the other vice-president. Party feeling in America has probably never been more dangerously impassioned than in the three years preceding this election; discount as one will the contrary obsessions of men like Fisher Ames, Hamilton and Jefferson, the time was fateful. Unable to induce Burr to avow Federalist principles, influential Federalists, in defiance of the constitution, contemplated the desperate alternative of preventing an election, and appointing an extra-constitutional (Federalist) president pro tempore. Better counsels, however, prevailed; Hamilton used his influence in favor of Jefferson as against Burr, and Jefferson became president, entering upon his duties on the 4th of March 1801. Republicans who had affiliated with the Federalists at the time of the X. Y. Z. disclosures returned; very many of the Federalists themselves Jefferson placated and drew over. "Believing," he wrote, "that (excepting the ardent monarchists) all our citizens agreed in ancient whig principles" -- or, as he elsewhere expressed it, in "republican forms" -- "I thought it advisable to define and declare them, and let them see the ground on which we can rally." This he did in his inaugural, which, though somewhat rhetorical, is a splendid and famous statement of democracy. His conciliatory policy produced a mild schism in his own party, but proved eminently wise, and the state elections of 1801 fulfilled his prophecy of 1791 that the policy of the Federalists would leave them "all head and no body." In 1804 he was re-elected by 162 out of 176 votes. Jefferson's administrations were distinguished by the simplicity that marked his conduct in private life. He eschewed the pomp and ceremonies, natural inheritances from English origins, that had been an innocent setting to the character of his two noble predecessors. His dress was of "plain cloth" on the day of his inauguration. Instead of driving to the Capitol in a coach and six, he walked without a guard or servant from his lodgings -- or, as a rival tradition has it, he rode, and hitched his horse to a neighboring fence -- attended by a crowd of citizens. Instead of opening Congress with a speech to which a formal reply was expected, he sent in a written message by a private hand. He discontinued the practice of sending ministers abroad in public vessels. Between himself and the governors of states he recognized no difference in rank. He would not have his birthday celebrated by state balls. The weekly levee was practically abandoned. Even such titles as "Excellency", "Honorable", "Mr." were distasteful to him. It was formally agreed in cabinet meeting that "when brought together in society, all are perfectly equal, whether foreign or domestic, titled or untitled, in or out of office." Thus diplomatic grades were ignored in social precedence and foreign relations were seriously compromised by dinner-table complications. One minister who appeared in gold lace and dress sword for his first, and regularly appointed, official call on the president, was received -- as he insisted with studied purpose -- by Jefferson in negligent undress and slippers down at the heel. All this was in part premeditated system -- a part of Jeffersons purpose to republicanize the government and public opinion, which was the distinguishing feature of his administration; but it was also simply the nature of the man. In the company he chose by preference, honesty and knowledge were his only tests. He knew absolutely no social distinctions in his willingness to perform services for the deserving. He held up to his daughter as an especial model the family of a poor but gifted mechanic as one wherein she would see "the best examples of rational living." "If it be possible," he said, "to be certainly conscious is of anything, I am conscious of feeling no difference between writing to the highest and lowest being on earth." Jefferson's first administration was marked by a reduction of the army, navy, diplomatic establishment and, to the uttermost, of governmental expenses; some reduction of the civil service, accompanied by a large shifting of offices to Republicans; and, above all, by the Louisiana Purchase, following which Meriwether Lewis and William Clark, sent by Jefferson, conducted their famous exploring expedition across the continent to the Pacific. Early in his term he carried out a policy he had urged upon the government when minister to France and when vice-president, by dispatching naval forces to coerce Tripoli into a decent respect for the trade of his country -- the first in Christendom to gain honorable immunity from tribute or piracy in the Mediterranean. The Louisiana Purchase, although the greatest "inconsistency" of his career, was also an illustration, in corresponding degree, of his essential practicality, and one of the greatest proofs of his statesmanship. It was the crowning achievement of his administration. It is often said that Jefferson established the "spoils system" by his changes in the civil service. He was the innovator, because for the first time there was opportunity for innovation. But mere justice requires attention to the fact that incentive to that innovation, and excuse for it, were found in the absolute one-party monopoly maintained by the Federalists. Moreover, Jefferson's ideals were high; his reasons for changes were in general excellent; he at least so far resisted the great pressure for office -- producing by his resistance dissatisfaction within his party -- as not to have lowered, apparently, the personnel of the service; and there were no such blots on his administration as President Adams's "midnight judges." Nevertheless, his record here was not clear of blots, showing a few regrettable inconsistencies. Among important but secondary measures of his second administration were the extinguishment of Indian titles, and promotion of Indian emigration to lands beyond the Mississippi; reorganization of the militia; fortification of the seaports; reduction of the public debt; and a simultaneous reduction of taxes. But his second term derives most of its historical interest from the unsuccessful efforts to convict Aaron Burr of treasonable acts in the south-west, and from the efforts made to maintain, without war, the rights of neutrals on the high seas. In his diplomacy with Napoleon and Great Britain Jefferson betrayed a painful incorrigibility of optimism. A national policy of "growling before fighting" -- later practised successfully enough by the United States -- was not then possible; and one writer has very justly said that what chiefly affects one in the whole matter is the pathos of it -- "a philosopher and a friend of peace struggling with a despot of superhuman genius, and a Tory cabinet of superhuman insolence and stolidity" (Trent). It is possible to regard the embargo policy dispassionately as an interesting illustration of Jeffersons love of peace. The idea -- a very old one with Jefferson -- was not entirely original; in essence it received other attempted applications in the Napoleonic period -- and especially in the continental blockade. Jefferson's statesmanship had the limitations of an agrarian outlook. The extreme to which he carried his advocacy of diplomatic isolation, his opposition to the creation of an adequate navy, his estimate of cities as "sores upon the body politic," his prejudice against manufactures, trust in farmers, and political distrust of the artisan class, all reflect them. When, on the 4th of March 1809, Jefferson retired from the presidency, he had been almost continuously in the public service for forty years. He refused to be re-elected for a third time, though requested by the legislatures of five states to be a candidate; and thus, with Washington's prior example, helped to establish a precedent deemed by him to be of great importance under a democratic government. His influence seemed scarcely lessened in his retirement. Madison and Monroe, his immediate successors -- neighbors and devoted friends, whom he had advised in their early education and led in their maturer years -- consulted him on all great questions, and there was no break of principles in the twenty-four years of the "Jeffersonian system." Jefferson was one of the greatest political managers his country has known. He had a quick eye for character, was genuinely amiable, uncontentious, tactful, masterful; and it may be assumed from his success that he was wary or shrewd to a degree. It is true, moreover, that, unless tested by a few unchanging principles, his acts were often strikingly inconsistent; and even when so tested, not infrequently remain so in appearance. Full explanations do not remove from some important transactions in his political life an impression of indirectness. But reasonable judgment must find very unjust the stigma of duplicity put upon him by the Federalists. Measured by the records of other men equally successful as political leaders, there seems little of this nature to criticize severely. Jefferson had the full courage of his convictions. Extreme as were his principles, his pertinacity in adhering to them and his independence of expression were quite as extreme. There were philosophic and philanthropic elements in his political faith which will always lead some to class him as a visionary and fanatic; but although he certainly indulged at times in dreams at which one may still smile, he was not, properly speaking, a visionary; nor can he with justice be stigmatized as a fanatic. He felt fervently, was not afraid to risk all on the conclusions to which his heart and his mind led him, declared himself with openness and energy; and he spoke and even wrote his conclusions, how ever bold or abstract, without troubling to detail his reasoning or clip his off-hand speculations. Certain it is that there is much in his utterances for a less robust democracy than his own to cavil at. Soar, however, as he might, he was essentially not a doctrinaire, but an empiricist; his mind was objective. Though he remained, to the end, firm in his belief that there had been an active monarchist party, this obsession did not carry him out of touch with the realities of human nature and of his time. He built with surety on the colonial past, and had a better reasoned view of the actual future than had any of his contemporaries. Events soon appraised the ultra-Federalist judgment of American democracy, so tersely expressed by Fisher Ames as like death... only the dismal passport to a more dismal hereafter"; and, with it, appraised Jefferson's word in his first inaugural for those who, "in the full tide of successful experiment," were ready to abandon a government that had so far kept them "free and firm, on the visionary fear that it might by possibility lack energy to preserve itself." Time soon tested, too, his principle that that government must prove the strongest on earth "where every man... would meet invasions of the public order as his own personal concern." He summed up as follows the difference between himself and the Hamiltonian group: "One feared most the ignorance of the people; the other the selfishness of rulers independent of them." 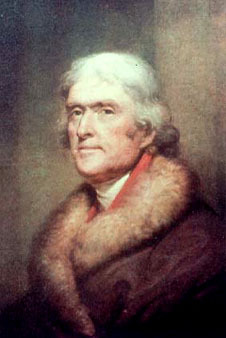 Jefferson, in short, had unlimited faith in the honesty of the people; a large faith in their common sense; believed that all is to be won by appealing to the reason of voters; that by education their ignorance can be eliminated; that human nature is indefinitely perfectible; that majorities rule, therefore, not only by virtue of force (which was Locke's ultimate justification of them), but of right. His importance as a maker of modern America can scarcely be overstated, for the ideas he advocated have become the very foundations of American republicanism. His administration ended the possibility, probability or certainty -- measure it as one will -- of the development of Federalism in the direction of class government; and the party he formed, inspired by the creed he gave it, fixed the democratic future of the nation. And by his own labors he had vindicated his faith in the experiment of self-government. Jefferson's last years were devoted to the establishment of the university of Virginia at Charlottesville, near his home. He planned the buildings, gathered its faculty -- mainly from abroad -- and shaped its organization. Practically all the great ideas of aim, administration and curriculum that dominated American universities at the end of the 19th century were anticipated by him. He hoped that the university might be a dominant influence in national culture, but circumstances crippled it. His educational plans had been maturing in his mind since 1776. His financial affairs in these last years gave him grave concern. His fine library of over 10,000 volumes was purchased at a low price by Congress in 1815, and a national contribution ($16,500) just before his death enabled him to die in peace. Though not personally extravagant, his salary, and the small income from his large estates, never sufficed to meet his generous maintenance of his representative position; and after his retirement from public life the numerous visitors to Monticello consumed the remnants of his property. He died on the 4th of July 1826, the fiftieth anniversary of the Declaration of Independence, on the same day as John Adams. He chose for his tomb the epitaph: "Here was buried Thomas Jefferson, author of the Declaration of American Independence, of the statute of Virginia for religious freedom, and father of the university of Virginia." Urinary tract infection, aggravated by prostate cancer. David Lynn Holmes, The Faiths of the Founding Fathers (2006), pages 87-88: "Whether Jefferson would have formally left the church of his ancestors is unclear. He remains listed in many histories as an Episcopalian rather than a Unitarian for the probably reason that Piedmont Virginia contained no Unitarian church. Unitarian societies were established in Baltimore, Georgetown, and the District of Columbia in the early part of the 19th Century, but the cities were much too far from Monticello. When Jefferson lived in Philadelphia, however, he attended Joseph Priestley's Unitarian church... In his last years, Jefferson clearly moved toward a more traditional interpretation of Christianity. He valued Jesus as a person even more highly. Unlike some Deists, he came to believe in prayer and a life after death. But belief in afterlife and in a God who hears prayer were standard Unitarian beliefs at the time."